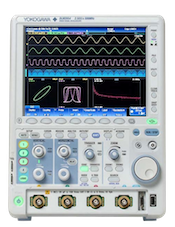 With the DLM2000 series mixed signal oscilloscope, up to 20,000 previously captured waveforms can be saved into the acquisition memory. You can use the HISTORY function to search, display and save just one or all of the previously captured waveforms(history waveforms). When HISTORY Mode is set to ONE, only one history *.WDF waveform data file of the measurement is saved. Remember that it is necessary to select which waveform number you wish to save using the Select No. button; ONE mode does not automatically save the last waveform acquired. HISTORY will not save all waveform data for ASCII file types, even if HISTORY mode is set to ALL.